Athletic. Athletic. Acer launches a 13.3-inch Chromebook dubbed CB5-311 on the market. A Tegra K1-ARM processor from Nvidia ticks inside. Our review reveals whether the laptop is compelling. Chromebook users do not have to tediously grapple with the laptop's software. After it is opened, the user only has to log in with their Google account and is ready to go. The system updates automatically in the background, and additional software is simply downloaded via the Chrome Store. To date, most Chromebooks have featured an 11.6-inch size. 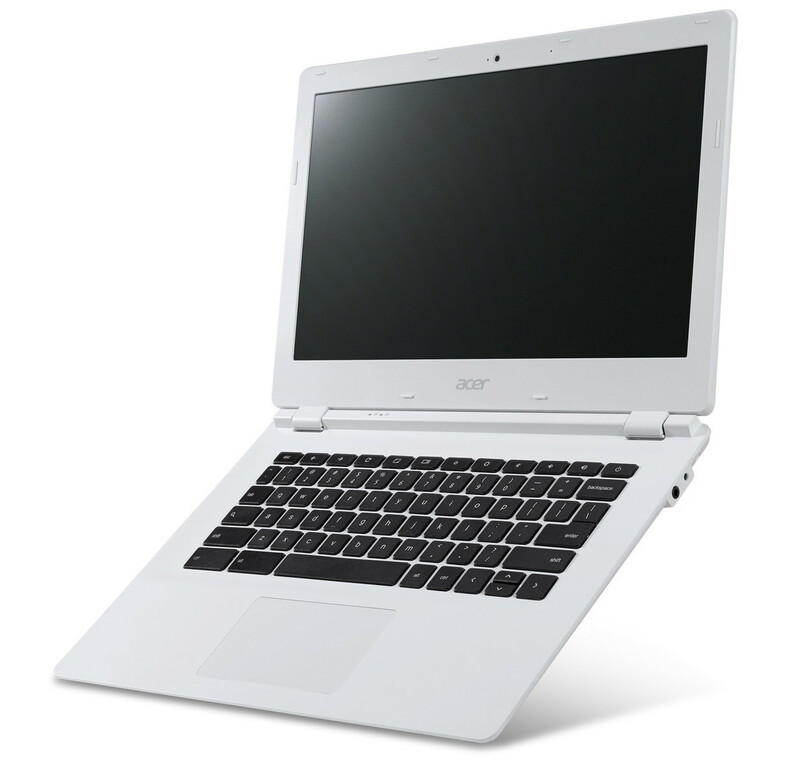 However, various manufacturers now build larger models, such as Acer with its Chromebook 13. Our report will determine whether the concept of a 13.3-inch Chromebook is convincing. Basically, all Chromebooks are rivals of the Chromebook 13. This is particularly true for Toshiba's Chromebook CB30-102 because it is also a 13.3-inch model. The technology of the Chromebook 13 is packed in a plastic casing with matte surfaces. The base unit can be dented under the touchpad and on both sides of the keyboard. Furthermore, the base unit is too easy to warp for our taste. This is even so for the lid. Not only does it twist easily, it yields clearly when pressure is applied from the back. On the other hand, the hinges are compelling as they keep the lid firmly in position. There are no surprises in terms of connectivity. The Chromebook 13 utilizes the interfaces that we find in most Chromebooks. Good: Both USB ports operate in USB 3.0 standard. The Chromebook 13 is equipped with an unlit chiclet keyboard. The black, flat, and smooth keys have a medium drop and clear pressure point. The keys' resistance could be a bit crisper. Overall, the keyboard is suitable even for longer typing sessions. An approximately 10.4 x 5.9 cm (4.1 x 2.32 inches) ClickPad (touchpad without dedicated keys) with multi-touch support, serves as the mouse replacement. Its large area facilitates gesture control, and its sleek surface allows the fingers to glide easily. The pad features a short drop and clear pressure point. 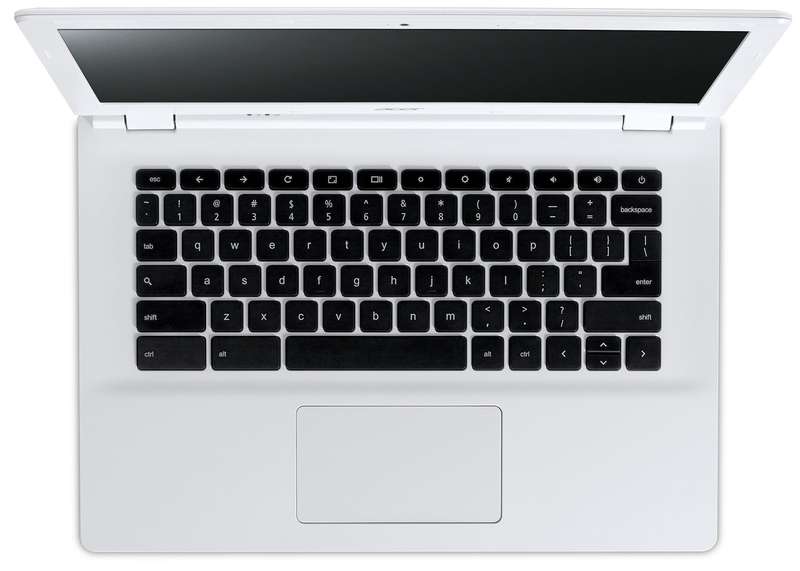 The Chromebook 13 is equipped with a 13.3-inch screen. The brightness (242.2 cd/m²), contrast (458:1) and black level (0.55 cd/m²) are entirely acceptable in view of the laptop's price range. The screen in Toshiba's Chromebook is on par here. However, a glossy screen is used in Toshiba's laptop. 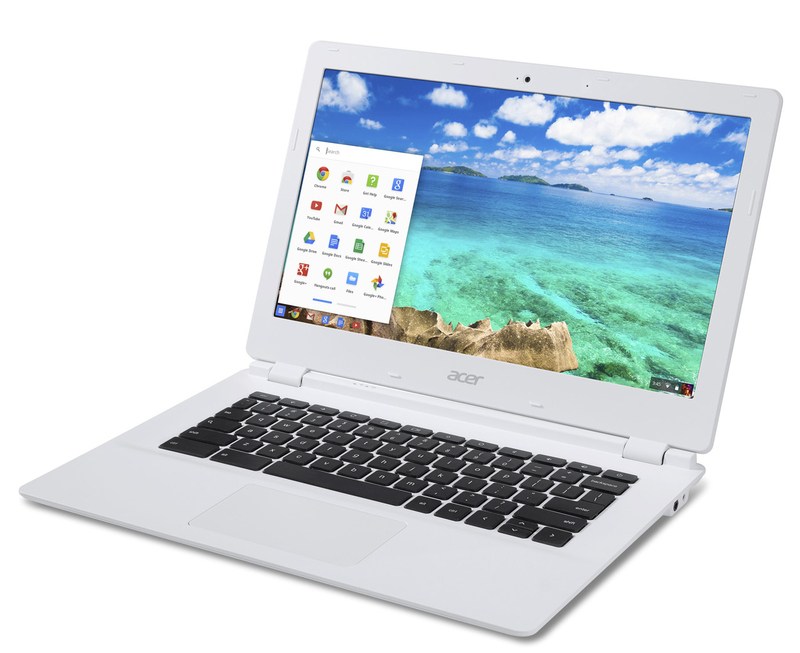 Acer's Chromebook is also available with a matte, Full HD screen. Acer installs a basic TN screen in the Chromebook 13. Consequently, the screen only has limited viewing angles. It is possible to use the Chromebook outdoors owing to the combination of a matte surface and adequate brightness. The Chromebook offers enough power for applications in the fields of office and Internet. Our review sample is available for about 299 Euros (~$377); other configurations are also available. Acer's Chromebook 13 CB5-311-T6R7 with a Full HD screen and 4 GB of working memory costs roughly 350 Euros (~$442). 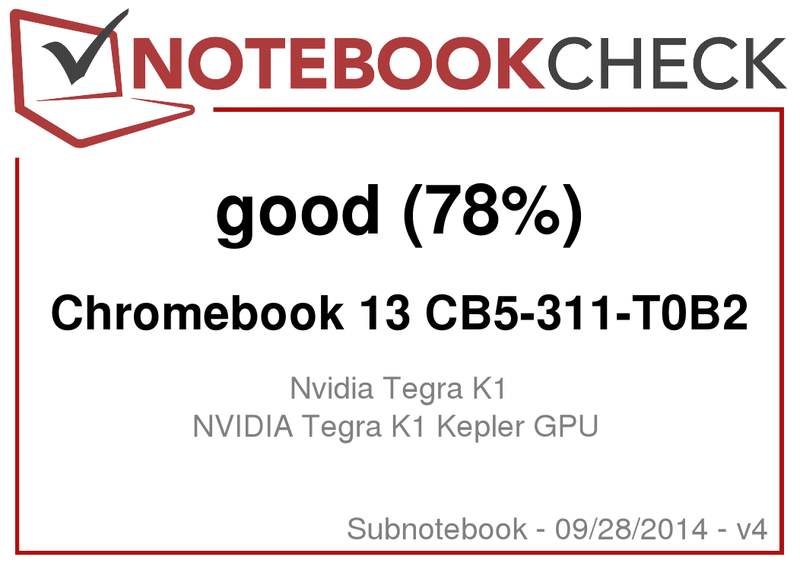 The Chromebook 13 is powered by Nvidia's Tegra K1 processor. The processor is comprised of five Cortex A15 cores. One of the cores (companion core) is not visible to the operating system, and is used for basic tasks to keep the laptop's power consumption low. A look at the multiple benchmarks we have performed shows that the performance of the Tegra K1 is roughly on par with Intel's Bay Trail Celeron N2930 and N2830. The Haswell Celeron in Toshiba's laptop is clearly superior. The system runs smoothly, and we did not experience any problems. ChromeOS booted within a few seconds, and applications opened quickly. An eMMC storage with a capacity of 32 GB is installed in the Chromebook 13. The user has approximately 22 GB available. Additionally, Chromebook 13 customers receive 100 GB of Cloud storage (Google Drive) free of charge for two years. The graphics card in the Chromebook is based on Nvidia's Kepler architecture, which is also used in the GeForce GT 740M graphics core. Thus, the core supports features like DirectX 11, CUDA and OpenGL. The Android GPU benchmarks are not available under Chrome, and therefore we cannot provide any scores. However, quite a few Tegra K1 based Android devices can be found in our database. The benchmark results of these devices reveal that the performance of Nvidia's GPU is roughly on par with Intel's HD Graphics 4400 graphics core. We tested WebGL Water demo and can confirm that the Chromebook 13 renders this demo very smoothly. Chromebooks with an HD Graphics (Bay Trail) GPU, such as Asus' C200MA-KX003 have difficulties with this demo. Also, the game Save the Day did not present us with problems and ran lag-free on the laptop. Asus' C200MA cannot keep up with Acer's Chromebook in this game either. The Chromebook does not have a fan, and consequently does not produce any noise. The Chromebook never gets excessively warm. We put the device under full load by simultaneously running both Google's V8 benchmark and a Full HD video in a loop. Here, we recorded a maximum temperature of 35 degrees Celsius (~95 °F) on one spot on the casing. (+) The average temperature for the upper side under maximal load is 27.2 °C / 81 F, compared to the average of 30.7 °C / 87 F for the devices in the class Subnotebook. (+) The maximum temperature on the upper side is 31.5 °C / 89 F, compared to the average of 35.8 °C / 96 F, ranging from 22 to 57 °C for the class Subnotebook. (+) The average temperature of the palmrest area of similar devices was 28.6 °C / 83.5 F (+2.6 °C / 4.7 F). The stereo speakers in the Chromebook 13 are located on the device's underside. They produce a thin sound that tends to be tinny. There is no bass whatsoever. Headphones or external speakers are needed for a better sound experience. While idling, power consumption of the Chromebook 13 ranges below 5 Watts - which is a very good rate. We could boost the power consumption of Acer's laptop up to 9.5 Watts by running a Full HD video alongside the benchmarks Peacekeeper and Browsermark 2014. This computing load will be very unlikely in practice, and the power consumption should therefore remain well below 10 Watts in everyday use. Toshiba's Chromebook cannot compete with Acer's model here, and consumes approximately twice as much power over the entire load range. Web sites are opened automatically every 40 seconds in the practical Wi-Fi test. The screen's brightness is set to about 150 cd/m². The Chromebook achieved a runtime of 10:04 h, which is a considerably better rate than that of Toshiba's Chromebook (7:07 h). 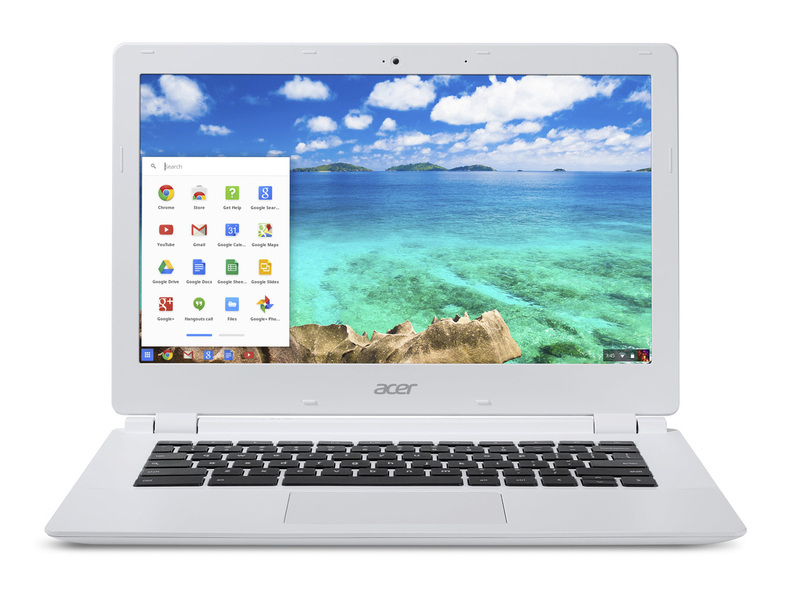 Acer's Chromebook 13 CB5-311-T0B2 makes an overall good impression. The CPU's performance is more than sufficient for the expected applications of a Chromebook, and ranges on the level of Intel's Bay Trail Celerons. The graphics core has a considerably higher performance, and can compete with Intel's HD Graphics 4400 graphics core. The computer operates silently, and barely heats up. Furthermore, the Chromebook offers good battery runtimes. It will last a day at the university or school with one battery charge. Not to forget the very decent keyboard. 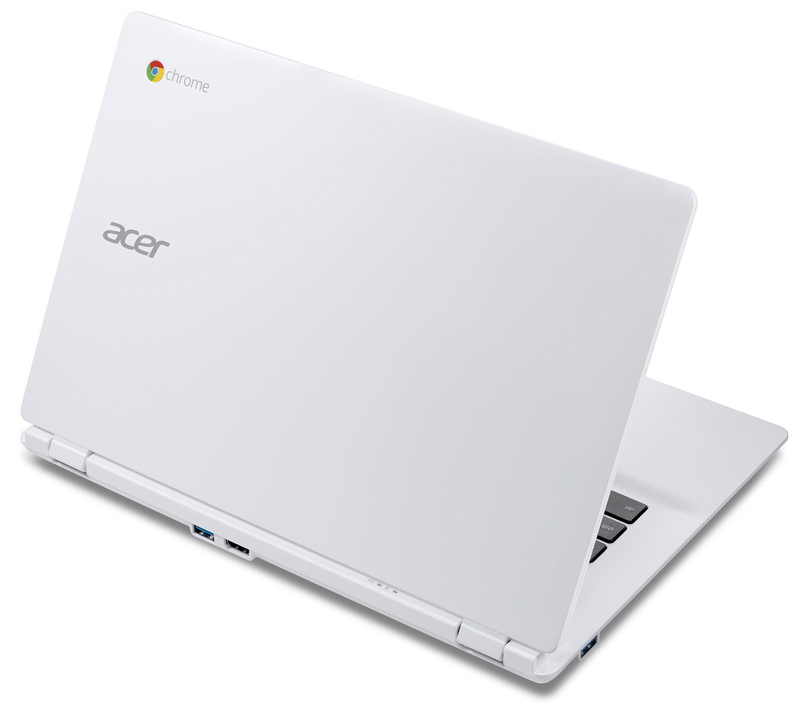 In Review: Acer Chromebook 13 CB5-311-T0B2. Test model courtesy of Notebooksbilliger.de. Nothing actually. However, a 3G/LTE modem would generally make Chromebooks less dependent on Wi-Fi. No surprises here. Acer offers an all-around deal for a price of 300 Euros.